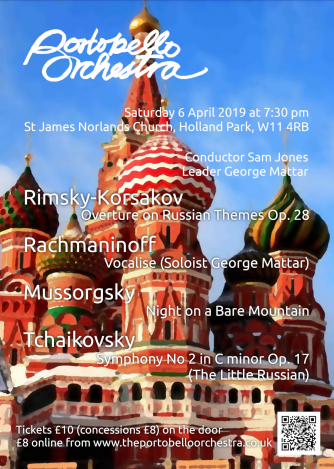 Our concert on 6th April offers a feast of delightful Russian melodies, along with the high drama and brilliant orchestral effects of Mussorgsky's "Night on a bare mountain". Our leader George Mattar joins us as soloist in the violin and orchestra version of Rachmaninoff's hauntingly beautiful "Vocalise". Please note the change of venue: this concert will now be at St James Norlands Church, not St Peter's Notting Hill as originally advertised.